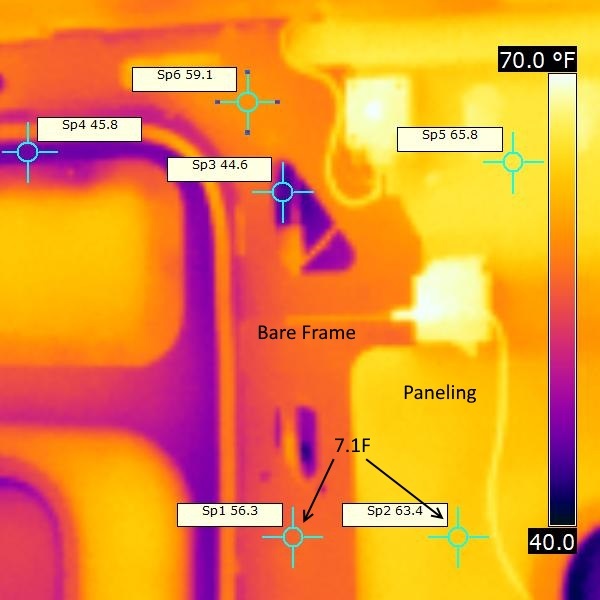 This is a followup to an earlier page looking at the heat loss due to metal frames and ribs in the van that were not insulated. Probably best to read the earlier page first if your have not already. Fill the frames and rib cavities with Thinsulate. 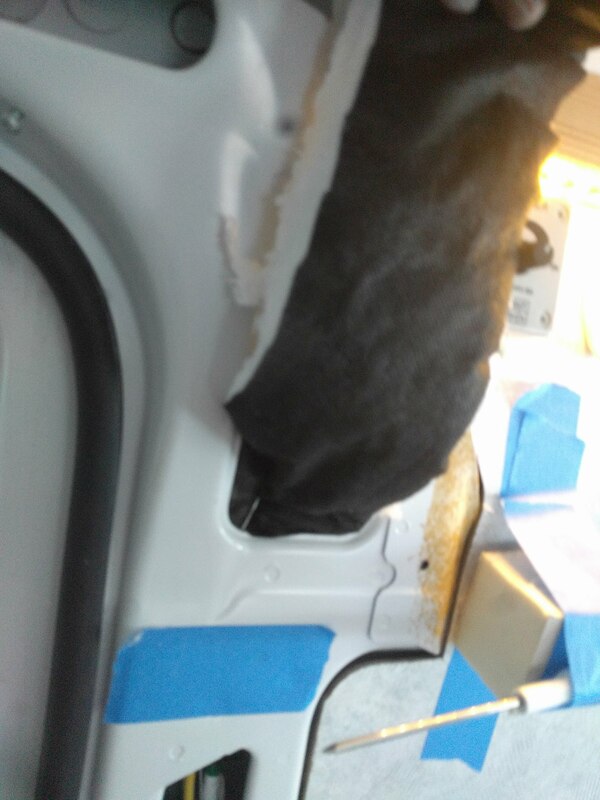 Apply a thin layer of foam over the metal frame or rib before paneling. The idea is to fill the frame cavity with the Thinsulate both to provide some insulation and to reduce airflow through the frame cavity. The thin foam is applied over the bare metal of the frame on the inside surface. This adds insulation in series with the thermal bridge created by the frame or rib. The thermal images were taken with a FLIR I7. Interior and exterior air temperatures were logged through test with an Onset Computer logger — logging outside temperature, and interior temps at ceiling, counter top height, and just above the floor (see plot below). The outside temperature varied from about 36F at the start to about 34F at the end. The van was heated by an electric space heater to provide more consistent interior temperatures than the van’s propane furnace. 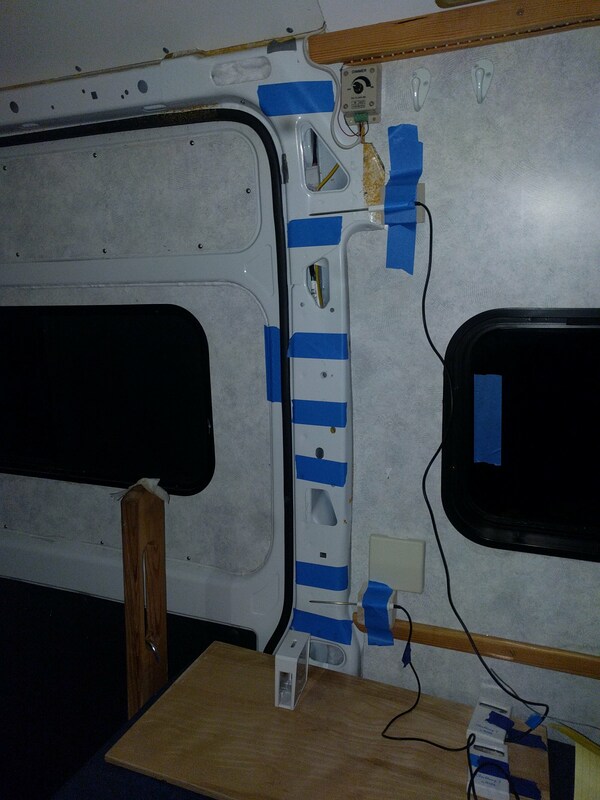 The space heater was left on full time and its full output was just sufficient to keep the van interior around 70F. I ran it for 3 hours before starting the test to stabilize interior temperatures. This reduced the variation in van temperature between the tests, but did not completely eliminate it. The day was overcast, so any effects of direct sun on the van were minimal. I did run the full test twice — the results here are for the 2nd run, but the first run results were similar. The Thinsulate for the test was provided by Hein at Impact Products — thanks! It is made by 3M and the product is SM600L — its about 1 5/8 inch thick and has an R value of 5.2. The Thinsulate is a bonded to a sturdy scrim sheet. Pulling the Thinsulate into the frame cavity. 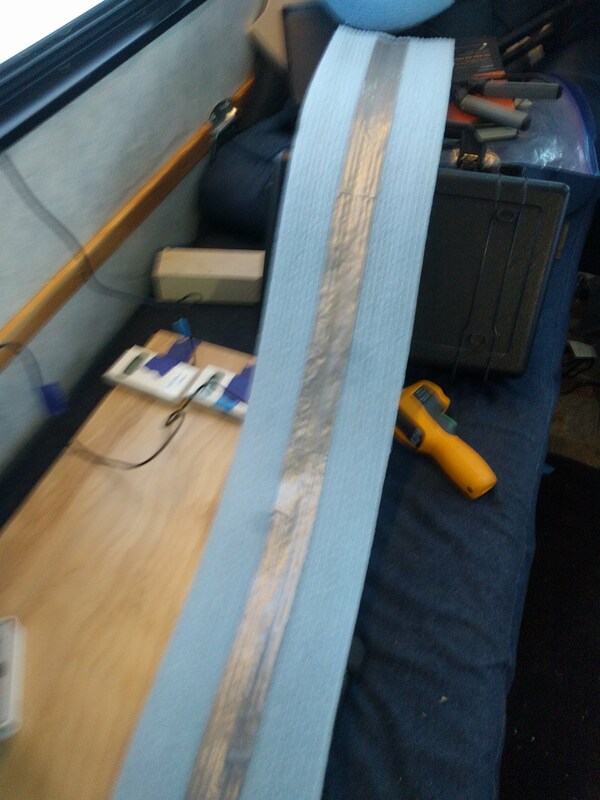 To install the Thinsulate, I ran a fairly stiff wire through the frame cavity first, then poked a hole in the strip of Thinsulate and pulled the Thinsulate through the frame using the wire. Pretty easy. The ceiling rib was a little harder as its not very deep, but not too bad. The PM has a solid web in the frame at about bed level. I filled the frame both above and below this web with Thinsulate. The foam I used is actually the left over seal strip that I used to seal the sill board on my shop building to the concrete slab. Its about 4 inches wide and about 1/4 inch thick. It was adhered with several strips of very tenacious double sided tape. It looks like its made from polyethylene. It probably would have been better to use thin rigid insulating foam board, but the sill sealer is what I had on hand. Something like the fan fold XPS insulation or half inch Polyiso would probably be a better choice. One theory for why the Thinsulate might be effective in reducing heat loss is that it would stop the air current that would be thermosyphoned down the open frame cavity. In order to get some idea what this air current was like with and without the Thinsulate, I used this Dwyer Vaneometer to measure the air velocity near the bottom of the frame. Its a really nice gadget for measuring very small air velocities that I’ve used a lot for thermosyphon solar air heating collectors — only $25. It can measure air velocities down to about 5 ft/min, which is really slow (0.06 mph). A thin plastic vane on a pivot at the top left is deflected by the airstream. 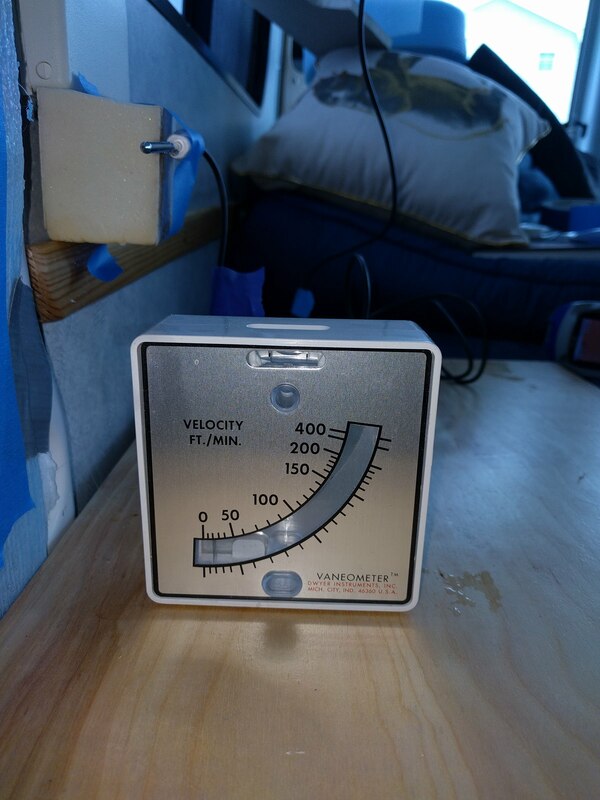 The down side is that it can only measure horizontal air velocity, so the shelf is positioned to deflect the vertical air current along the frame to horizontal. The shelf is positioned just below the solid web in the frame that blocks downward airflow — idea being that such flow will be diverted outward to the meter. The frame I used is the one on the passenger side just behind the sliding door. I used this one instead of the one on the driver side because the driver side one had LOTS of wires running through it. The test frame before insulating. The painters tape is a check a check to make sure the frame material has an emissivity close to 0.95, which is what the camera is expecting. The painters tape does have an emissivity of 0.95, so if you can’t see it on the IR pictures the underlying material also has an emissivity near 0.95. The tests were all done the same day over a period of about 1.5 hours. I let the space heater run for three hours in the van so that temperatures were stable. I waited about 15 minutes between each test to give the temperatures time to stabilized for each new insulation condition. This plot shows the inside and outside temperatures over the test time. 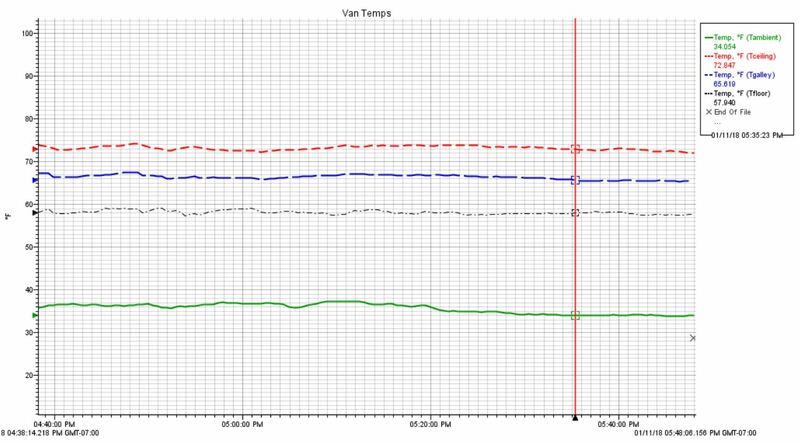 The top red line is the temperature near the ceiling (about 73F), blue line is temperature at counter top level (about 66F), and green line is outside temperature (about 34F). The electric space heater is able to maintain an about 34 F difference between inside and outside (its a 1500 watt heater). The inside temperature trends down a bit toward the end because the outside temperature is dropping — but, the inside to outside difference remains close to 34F. Point being, conditions through the test were pretty constant. This is the baseline for the other tests with insulation. This is the IR picture of the bare metal frame before any insulation was added. The temperature difference between the wall paneling and the bare metal of the frame was 7.1 F. This is the baseline for the Thinsulate and foam insulation test. The velocity of the air at the velocity meter was about 15 fpm (0.17 mph). I should mention that the velocity measured varied quite a bit. If I moved or the dog moved it might go up to 30 fpm until things settled down. Even when all was very quiet, it varied a few fpm. So, the 15 fpm in this case is an average of watching the meter for 30 seconds or so. The difference in surface temperature between the insulated wall panel and frame goes from 7.1F to 4.9 F for the Thinsulate inulated frame. Anything that brings the surface temperature on the frame closer to the well insulated paneled area is a plus. The average air velocity was about 12 fpm. 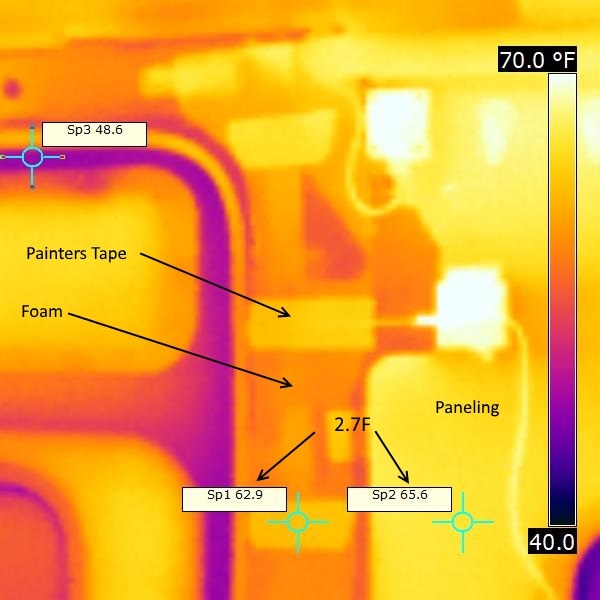 This is the thermal image for the 1/4 inch foam insulation over the frame metal held in place with several lines of double stick tape. The strips of painters tape on the foam (which show up as lighter on the image) show that the foam does not have an emissivity of 0.95, which is what the camera is set for. 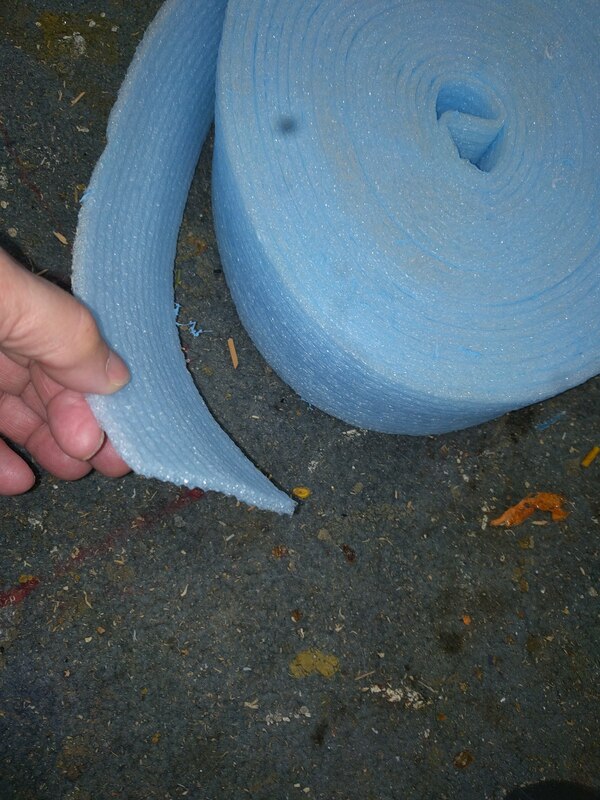 So, the for the foam surface, the only valid temperatures are on the painters tape strips. The difference in surface temperature between the insulated wall panel and frame goes from 7.1F to 2.7 F for the foam insulation — a good improvement in surface temperature. The average air velocity was about 12 fpm . Heat Loss: Based on the test showing lower frame surface temperatures, I think its safe to say that both the Thinsulate and the foam reduce heat loss due to thermal bridging at the frame. 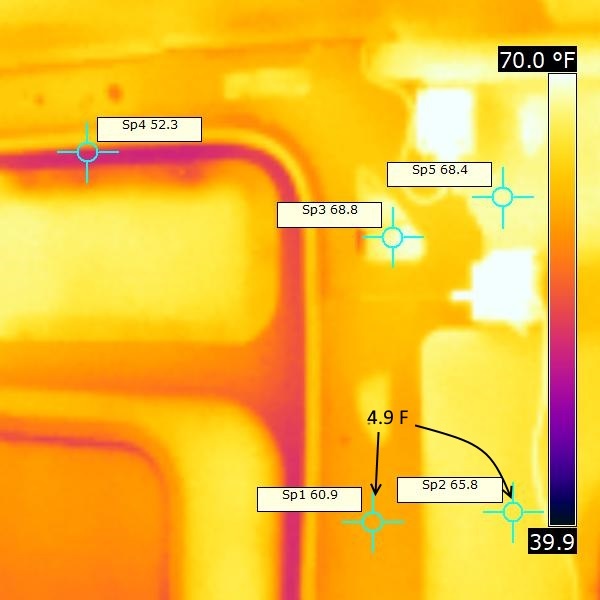 Comparing the bare frame and insulated frame surface temperatures, I would say the reduction in heat loss is likely significant — maybe of the order of third to a half of the thermal bridging loss. 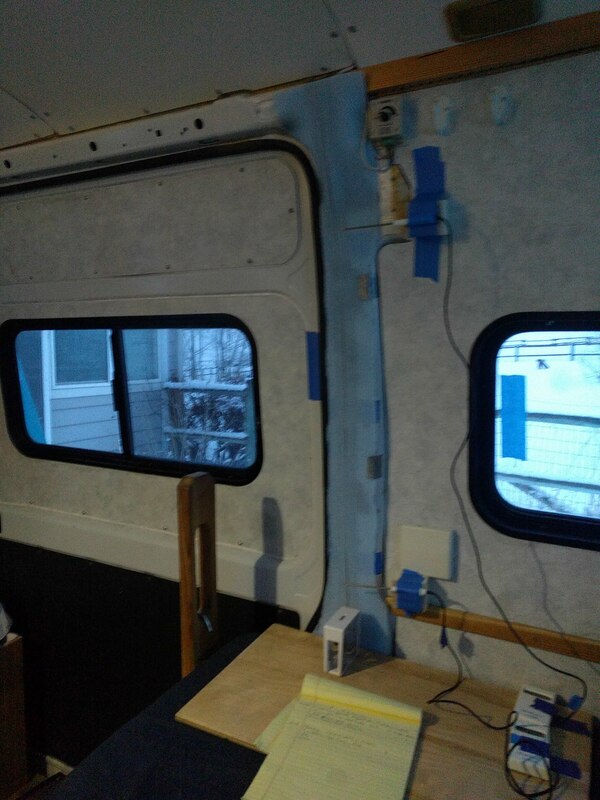 Based on the earlier test, cutting the thermal bridging by a third to a half would decrease the total heat loss for an otherwise well insulated van by roughly 8 to 12%. Air Currents: I’m unable to find a whole lot of difference in the air velocity between the bare frame and insulated schemes. The Thinsulate and foam do show a small reduction in air velocity, but given the difficulty in getting good readings, it may not be significant. It may be that my velocity measuring setup was not good enough to see the differences — it does make sense to me that there should be an air current down the frame and that the Thinsulate and foam should reduce it — I just could not verify it with my setup. RD and others on the PM forum report sleeping next to the cold back wall of the van does seem colder, and the drafts might be the reason. Another possibility is that it feels colder because of radiant heat exchange between your body and the cold wall surface makes that space feel colder. Its an accepted HVAC fact that you can have two rooms with 70F air, and if one has a lower wall surface temperature than the other, it will feel colder because of the radiant heat exchange between your body and the wall. Since the added insulation did warm up the inside frame surface, it should help make the space feel warmer. So, you have decide if the improvements due to insulating the thermal bridges are worth it. If you camp mostly in warm weather, then probably not, but its probably worth the effort for cold weather campers. The insulation should improve both heat loss and comfort. If I were doing my conversion again, I’d likely do one of the two frame insulation methods. There is likely also a benefit for hot weather camping with an AC. But, I’d say that the insulation priorities are ceiling, walls, floor, and windows before the thermal bridges. You don’t need an IR camera to do the test as shown on this page. A regular IR temperature gun could be used to measure the temperature on the paneling vs the temperature on the frame. If uncertain of the emissivity of the materials you are using, use painters tape on the surface where you take the measurements. Anything that brings the frame temperatures closer to the insulated wall temperatures is a plus. Like so much of your site, this is super helpful. I am done insulating with polyiso and great stuff and have been trying to decide what to do with the ribs and other small cavities. I will be using the van in some cold weather but not Wisconsin in the winter kind of cold. Wrapping the ribs with foam looks like a pretty easy solution. Would you also try to fill them (I have been considering wool) or do you think that would be a lot more effort for not much gain? Also, would you see any issue in drilling right through the foam to attach my ceiling planks and wall boards? Thanks for such providing such great resources!